Multimodal bill of lading (MBL) is a transport document, which is used in international trade transactions where at least two different modes of transport have been practiced in order to complete the shipment. A transport document can only be accepted as a multimodal bill of lading, multimodal transport document or combined transport document, however named, only if it is possible to understand on the face of the document that at least two different modes of transport have been utilized. For example if a transport document evidencing multiple modes of transport such as road and sea shipments, road and air shipments or road and rails shipments etc, then it is a multimodal transport document. In order to determine whether or not multiple modes of transport have been used in a particular transport document, you should understand different aspects of delivery places. 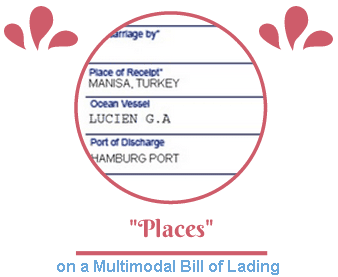 In a typical multimodal bill of lading following delivery places are expected to be shown: Place of receipt, port of loading, port of discharge and place of delivery. Today I want to explain how these places should be completed on a multimodal bill of lading. 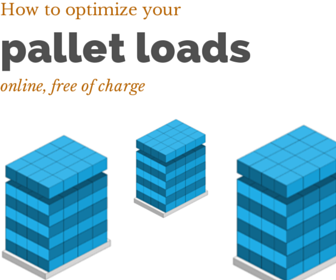 After reading this page you should be able to understand basic concepts regarding place of receipt, port of loading, port of discharge and place of delivery stated on a multimodal bill of lading. Place of Receipt: Place of receipt is the place where shipper handed over the goods to the carrier. In some situations place of receipt is a place within the port of loading such as Container Yard (CY), Container Terminal or Container Freight Station (CFS). In other situations place of receipt may be located hundreds of kilometers away from the port of loading such as place of receipt is the shipper's factory, which is located 200km away from the port of loading. An exporter from Netherlands signs a sale contract with his buyer in India. The contract covers the sale of 20 metric tons iron scrap. Shipment will be dispatched via FCL of 1 x 40ft dry container. Goods will be delivered to buyer at the seller's warehouse which is located inside the Port of Rotterdam. The goods will be shipped on board a container vessel at the Port of Rotterdam and discharged at Nhava Sheva Port. The goods later on delivered to Inland Container Depot (ICD) located in Ludhiana. Port of Loading: Port of loading defines the port where goods are on board a named vessel. Shipment must follow the agreed route from place of receipt to place of delivery, as a result the port of loading stated on the multimodal bill of lading must not conflict with the one mentioned on the sales contract. Some incoterms, such as FOB and CIF, give great importance to port of lading as risk passes from exporter to importer at the port of loading when goods are loaded on board a named vessel. In case the chosen incoterms have defined a specific port of loading on the sales contract, exporter may face legal difficulties if he changes it without the consent of the buyer. Finally according to letter of credit rules port of loading stated in the L/C must match port of loading stated on the bill of lading. You should be very careful about this subject if you are going to be using letter of credit as a payment option. Port of Discharge: Port of discharge is the place where the vessel is off-loaded and the goods are distributed to their respective consignees. Shipment must follow the agreed route from place of receipt to place of delivery, as a result the port of discharge stated on the multimodal bill of lading must not conflict with the one mentioned on the sales contract. Port of discharge is very important concept especially in CFR and CIF incoterms, because seller pays for the freight and insurance (where applicable) up to port of discharge. Important Note 1: FOB, CIF, CFR and FAS could only be used with port to port sea shipments. If you are going to use a multimodal bill of lading evidencing utilization of more than one mode of transport, then it is not appropriate using FOB, CIF, CFR and FAS incoterms with this transaction. Please do not confuse place of delivery with the place up to where the freight and insurance must be paid under FOB and CIF incoterms. According to incoterms 2010 rules both FOB and CIF trade terms point out the same delivery place, which is shipped on board of vessel at the port of loading. Exporters pay the freight and insurance costs up to the port of discharge under CIF incoterms. For further information please read "What are the differences between CIF and FOB?" Place of Delivery: Place of delivery is the final point of the multimodal transportation. In most instances place of delivery is the buyer's warehouse or a bonded warehouse which is located close to buyer's premises. On the above example place of delivery is Inland Container Depot (ICD) in Ludhiana, India. 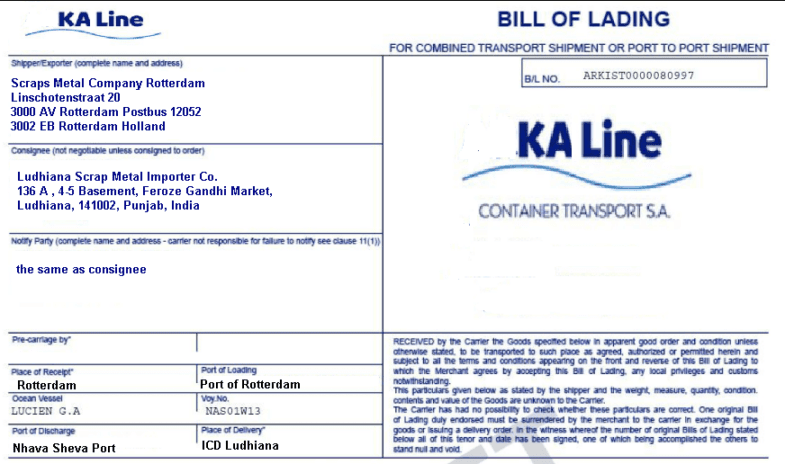 We understand from the multimodal bill of lading's consignee field that the buyer is also located in Ludhiana, India. The goods may have been transported from port of discharge, Nhava Sheva Port, to place of delivery either by road or rails transportation.